First new English translation for 50 years. Includes illustrations by Jean-Louis Forain. First published in 1876, Marthe, the story of a whore was an important landmark in J.-K. Huysmans’ literary career: it was the 28-year old writer’s first excursion into the novel form and propelled him into the growing ranks of the Naturalist movement, then beginning to take shape under Zola’s direction. 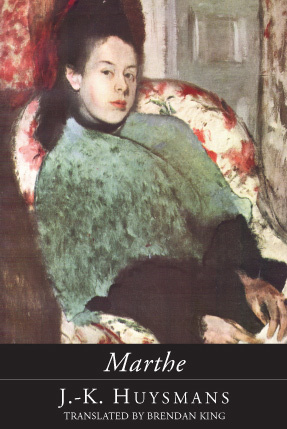 Marthe was one of the first French novels to tackle head-on the subject of prostitution, a theme that was to become a central preoccupation in the work of many novelists, painters and poets of the period. Set in and around the demi-monde of the Parisian musichall, it centres on a would-be actress, Marthe, who works in one of the lowest dives in Paris, and tells the story of her brief and ultimately doomed relationship with Léo, a disillusioned romantic searching for something to take the place of his lost illusions. Written in a lively argot comprising contemporary slang and popular expressions, this bleak story of the failure of love in a world in which commerce is a more powerful force than idealism is told with Huysmans’ typically caustic sense of humour. As a novel, Marthe represents a formal rejection of the Romanticism of Murger’s Scenes from Bohemian Life, and offers a fascinating glimpse into the aesthetics of the early Naturalist movement. But the book can also be read as a fascinating social document in its own right, one that throws a piercing light on the moral values and social practices of the time. This new translation by Brendan King is the first for nearly fifty years. Capturing the lively linguistic inventiveness of the original, it also includes an introduction and comprehensive notes.